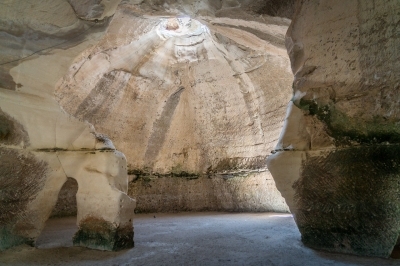 The Caves of Maresha and Bet Guvrin are man-made subterranean complexes up to 2,000 years old. These archaeological sites are situated below the ancient twin towns of Maresha and Bet Guvrin in Lower Judea. In a layer of soft chalk some 475 cave complexes have been carved out during different periods. The area was in use from the Iron Age to Persian, Judaic, Hellenistic, Roman and Byzantine antiquity. Some forty burial sites were dug into the ground at the foot of the hills close to Maresha, including three main necropolises. The region is close to the ancient route linking Mesopotamia to Egypt. Agricultural practice is also very old, the caves were for example in use for the pressing and storage of olive oil and for raising pigeons. 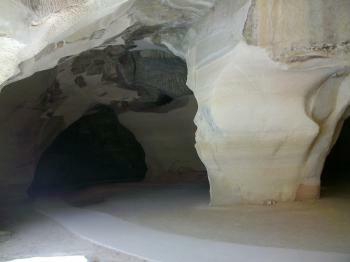 Some fifteen key caves have been opened to the public. The entire nominated property is included in the ‘National Archaeological Park of Bet Guvrin – Maresha’. There are several parts of Bet Guvrin which I found fascinating. First, it is one of the only places in Israel where the public can participate in an archaeological dig. There are numerous caverns which were dug under the houses of people in the area which were later used for garbage. Because the artifacts in the garbage were mixed, there are no formal strata that need to be preserved, so they are willing the let the public help out in digging. Also, all of the caverns were dug by hand and many of them are enormous. They were dug over centuries by just extending the floor of the cavern further down. It is a popular attraction for Israelis but few foreigners bother to visit. I visited the Caves of Maresha and Bet Guvrin the day after I arrived in Israel. The flights from the Netherlands arrive passed midnight and the next day i drove from the airport to Jerusalem but first visited the Caves of Maresha and Bet Guvrin. It's a nice park; and best to go around by car. The Roman parts are outside the park and free to visit. In the park there are 4 places to park the car and see the caves around there. It looks small if you're at the entrace, but once you go underground some complexes are very big. I really enjoyed my visit. Do take a pick nick lunch! Lots of places to eat but not much available in the park. Recommend to go from Tel Aviv or Jerusalem; easily reached in a day by car. Photo's see the link below. Bet Guvrin-Maresha National Park is located in about one hour drive from Jerusalem to the south, in a very nice area next to the boarder with Palestine. 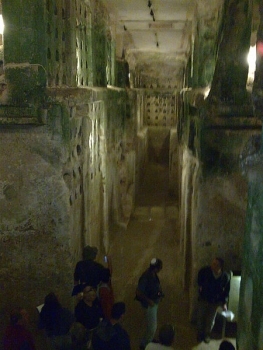 The complex consists of excavations in Maresha and more famous caves in Bet Guvrin. The whole site is quite large, which makes it difficult but doable without a car. Unfortunately, due to the lack of time that day we were not able to visit Maresha, so we focused on the caves of Bet Guvrin. There are in general two types of caves in the park – first ones, much smaller and shallow, served as burial places during Sydonian times. They are covered with well-preserved paintings and Greek inscriptions. Then, around 1km ahead, there are famous bell caves – about 800 beautiful grottos spread over a picturesque area. Although they look like made by nature, I was surprised to find that most of them were actually human-bored. Most of them have holes in the center of the ceiling and sunlight plays inside making the interior view very intersesting. I found this WHS one of the most interesting in Israel and it is strange to me that it is so rarely visited. During our visit in December only few tourists were there and even the entrance was free (or maybe we just did not notice the ticket office). We included the National Park of Bet Guvrin-Maresha in our tour of Israel, just a few weeks after the site has been included in the Unesco family.There was no commemorative plate yet.I would say its a great advantage of travelling with a car as the different sites within the park are far from each other.They give you a handy leaflet at the entrance with detailled informations.Bet Guvrin was for me quite special for the variety of beautiful caves dug by its former inhabitants.There you find the Columbarium Cave where doves were raised in over 2000 niches-for their eggs, meat and also the fertilizer was used.Doves were also sacrified in religious rituals.Just in Maresha (which was abandoned during the Roman period) some 85 combarium caves have been found, with tens of thousand of niches. Other hightlights are the socalled Sidonian caves which were used during the Hellenistic period as burial grounds. They contain rich frescoes and inscriptions. The Bell Caves date from the Byzantine period and are a great sight, not to be missed at the end of the circuit. They come in all shades of greytones, and are really huge. Bet Guvrin-Maresha is a large archaeological park with abundant testimonies to its different inhabitants in the course of history including Edomites, Phoenicians, Greeks, Jews, Romans, Crusaders and Arabs. The site is mostly known for its exceptional elaborate cave system which was carved in the soft rock for different domestic and agricultural purposes. I would certainly recommend not to miss the Roman amphitheatre at the site. It is not as impressive as the ones in Verona and Rome but it is certainly the best one in Israel. Another prominent finding were the Phoenician tombs covered with frescoes. The Crusades: There is a Crusader church in Bet Guvrin used by the Knights Hospitalers. Knights Hospitaller: There is a Crusader church in Bet Guvrin used by the Knights Hospitalers. Mentioned in the Bible: Maresha: "And Rehoboam...built cities for defense in Judah...Gath, and Mareshah, and Ziph" (2 Chron. 11:5-8).